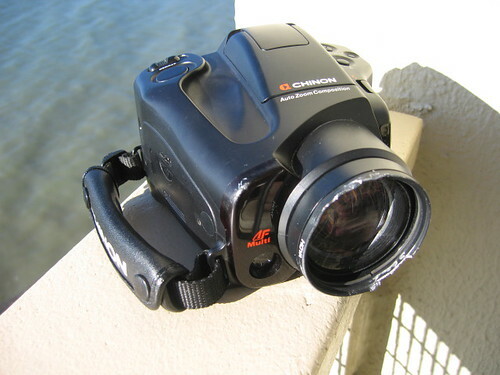 The Genesis series from Chinon helped define the the late 1980s and early 1990s category of 35mm "bridge cameras." These were models offering more advanced features associated with SLRs (parallax-free framing and a well-specified zoom lens), but with "point & shoot" ease of use (autofocus, DX-code film-speed setting; motorized film transport). 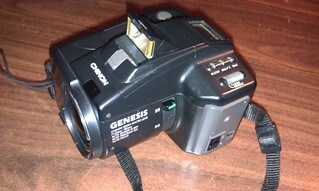 In attempting to launch a distinct market niche, the styling of the Genesis series might charitably be called "non-traditional"—an aspect shared by many of its peers such as the Yashica Samurai, the Ricoh Mirai, Canon Photura, etc. The Genesis series went through four model revisions during its production history, beginning in 1988 and extending through the early 1990s. The original Genesis introduced the concept of the "zoom-lens reflex," a camera with true SLR viewing but a non-removable zoom lens covering most typical situations. In Chinon's case, this was a 35-80mm (f/4.1–6.4) lens of 8 elements in 7 groups, with a manual zoom lever. The lens uses active infrared autofocus (helpful in dim light) and has a modest manual-focus "macro" range down to 0.5 m (20"). 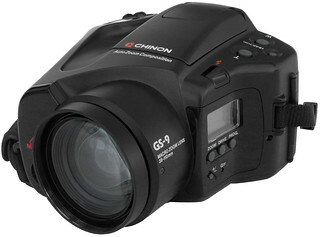 This is an update of the GS-7. Its power-on switch was moved away from the flash cover. 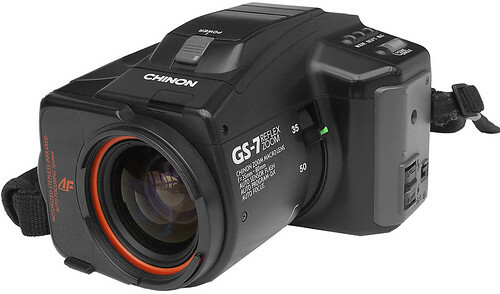 Its flash is in a higher position than that of the GS-7. With this model Changed to a less boxy, more smoothed-out body style; also the zoom lens range was extended slightly towards the telephoto end, now 38-110mm (f/4.4–5.6) and zooming by motor rather than manual lever. Focus was upgraded too, with the addition of passive autofocus to the active infrared-beam focus system. Standard mode of this camera is the 'standard zoom composition'. This feature means that the focal length is chosen automatically by the camera. 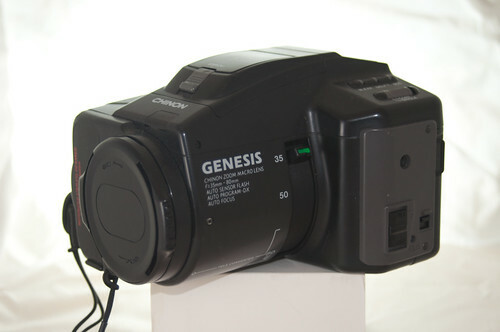 The Genesis IV further extended the range of the built-in zoom, to 38–135mm (f/4.0–5.6), which had grown to 13 elements in 10 groups. This page was last edited on 31 October 2014, at 03:21.